Android 7.0 Nectar, Nutella, Neopolitan, Nacho or Nougat (not Nugget)? Google has always named its Android OS updates after sweet treats, and in alphabetical order. So far we’ve had Cupcake, Donut, Eclair, Froyo, Gingerbread, Honeycomb, Ice Cream Sandwich, Jelly Bean, KitKat, Lollipop and Marshmallow. The big hairy deal of the week is the announcement that this year’s Google I/O will run from 18 to 20 May. Google loves to create excitement in Android community through such situations. But as of recent interview of Sundar Pichai responding to a question during an interaction with students at Delhi’s Shri Ram College of Commerce, said that the company was open to naming the next version of Android – Android N – after an Indian sweet. He said that Google could conduct an online poll to decide on the name. For now, our money is on Android 7.0 Nutella. As its a popular product all over the world. The notable exception of 4.4 version which was called KitKat, after the popular chocolate candy bar shows that the latest version, Android N would be Nutella, brand name of an Italian sweetened hazelnut cocoa spread. Google partnered with Nestle so it wouldn’t be surprising if the company partners with Nutella for Android N.
But that’s just our guess! Some other suggestions include Android Nacho, Android Nectar, Android Nougat (Android Nugget anyone? ), Android Neopolitan and Android Nuts (probably a no-go). But as per the recent Polls, most of the users prefer Android Nutella. So, most probably Android N will be named as Android Nutella. But again, it’s just a guess! Android N will get its first outing at Google I/O 2016, which has now been confirmed to run 18 to 20 May 2016. Google will offer an Android N Developer Preview, which you will be able to install on its current Nexus devices for early testing. Later in the year, most likely October 2016 (although in 2015 we saw Google announce Android Marshmallow early at the end of September), the final version of Android N will be announced. It will ship preinstalled on whichever new Nexus devices Google creates for 2016 (Nexus 7? 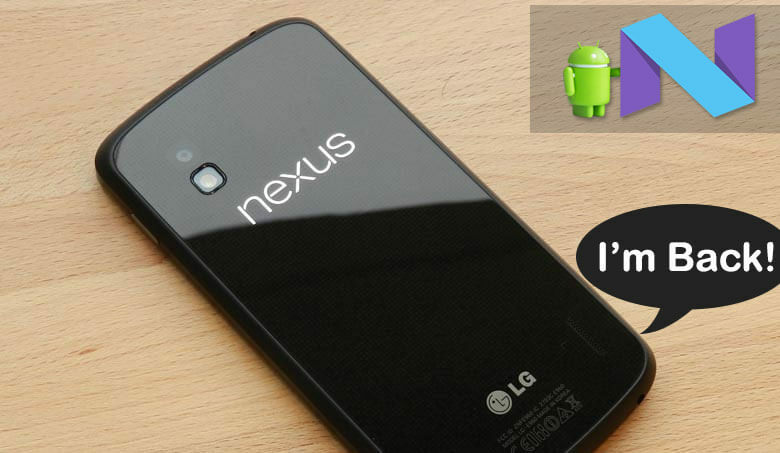 ), most likely sticking to new Nexus phones, and will be available to download to older Nexus devices soon after. Other flagship Android devices will get the upgrade toward the end of the year or early 2017. As we have already seen Android N will support Multi-window. It’s also been rumored that the next version of Android will ‘kill’ Chrome OS, and that the two operating systems will become one with Chrome folded into Android. This is something Google has apparently been working on for a long time and, while it has recently made some progress, the single OS isn’t expected to be ready until 2017, making it more likely that if any Android OS is to kill off Chrome OS it will be Android 8.0 O. Google will want to increase its market share with laptops (proper laptops rather than tablet hybrids) running Android, but for now the company has confirmed that both operating systems will continue to exist. So far only the Multi-windows features is disclosed by Google. But, Google is expected to bring a big change for Chrome along with the above features. Since Sundar Pichai, the former head of Chrome and Android is now the CEO of Google, Android Headlines claims that he would unveil a preview version of the operating system later this year, and a final version of the merged OS may be launched in 2017. Andrew Bowers said on Reddit during an AMA about the Pixel C that “we’d spoil the surprise of N if we shared all of them. Split screen is in the works!” Google may introduce this feature for tablets, making the larger devices more useful. Moreover, it can compete with Apple’s new software features on the iPad. Google Now launcher: If you’re using the Google Now Launcher you’ll be delighted to hear that it now actually makes icons appear to be all the same size rather than a mishmash of every developer’s designs that leaves your app screen looking like something out of a Escher painting. Google Maps: Google Maps has been given even more contextual functionality with the arrival of an information spread based on where you are, where you’ve been and therefore where it thinks you’re likely to go. It can show snarl-ups delaying traffic, en route petrol prices and alternative routes, all of which it could do before but now does without you having to press anything. In terms of actual new features in Android N it’s a bit too early too tell, especially given that most Android users are still waiting for the Marshmallow upgrade. However, we will continue to update this article until Android 7.0 N’s release, including new rumours and information as we hear it.